And here is the next-to-last set of USA related sports factsheets, this time for the four Nordic sports of cross-country skiing, biathlon, Nordic combined, and ski jumping. Tomorrow, we’ll finish up the USA sports factsheets with the team sports of curling and ice hockey. Later this week, now that the sports quotas have closed (19 Jan), we will start giving National Factsheets for the competing nations at Sochi. From 1924-60 there was one ski jumping event held at the Winter Olympics, termed the normal hill event. In 1964 a second competition on the large hill was added. In 1988 a team event on the large event became the third Olympic ski jumping event. Women will compete in ski jumping at the Olympics for the first time at Sochi in 2014, jumping off the normal hill. But “normal” hill and “large” hill are not fixed definitions. The hills have varied significantly over the years and the hills have continued to get larger over time. 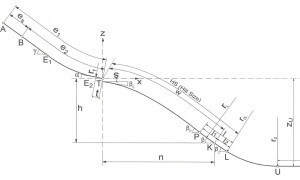 The design of a ski jumping hill is complex with numerous tables and charts defining the mathematical analysis available in multiple sources. 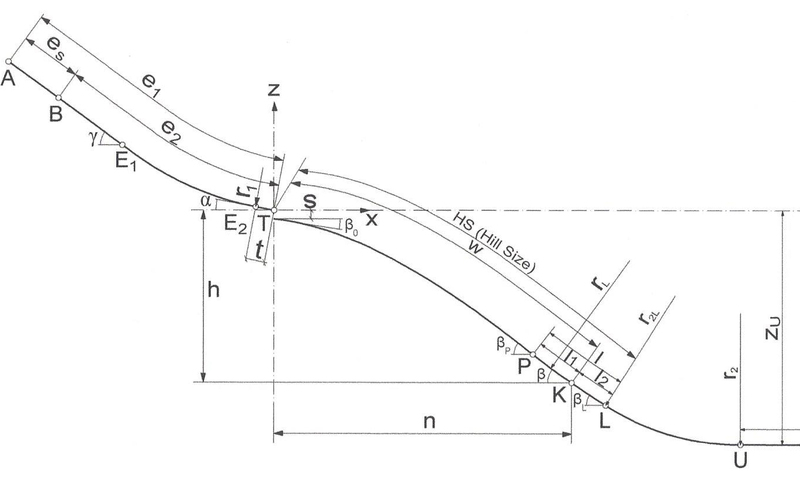 Ski jumping hills are often defined by what is known as the K-point (for K/critical, or construction, point). Currently, a normal hill has a K-point of about 90 metres, while a large hill K-point is usually about 120 metres. But as you can see below, the last two Winter Olympics, and Sochi, have had slightly larger hills, at 95 and 125 metres, respectively. The K-point defines the average point on the landing hill where the jumpers are expected to land, for maximum safety. It can actually be defined as the inflection point where the landing hill curvature changes from convex to concave. There are also larger hills used, but not at the Olympics. These are termed ski flying hills, in which the K-point is at 180-185 metres, usually, although the largest hill is at Vikersund, Norway, with a K-point of 195 metres. Ski flyers often jump over 200 metres, with the current world best 246.5 metres (809 feet), set by Norwegian Johan Evensen on the Vikersund hill in February 2011. In addition to the K-point, jumping hills used to be measured by Table Point, but this was usually within a few metres of the K-point and K-point was used more frequently. Table Point was introduced at the Olympics in 1972, but in 1984 Table Point and K-point became synonymous and Table Point is no longer used. There are occasions in ski jumping where the jumpers will start “out-jumping the hill.” This is when, because of ideal conditions of wind, snow, or ice, the jumpers start landing well-below the K-point, and especially below the L-point. If that happens, it can be dangerous for the jumpers because they are not coming down in the landing area, and the officials may stop the competition, and re-start it with a lower start on the jumping hill in-run. The FIS actually defines hills by Hill Size, with the current specifications as follows: 1) Small hill – up to 49 m; 2) Medium hill – 50-84 m; 3) Normal hill – 85-109 m; 4) Large hill – 110 m and larger (presumably up to 184 m); 5) Flying hill – 185 m and larger. One thing to note is that the hills for Torino (2006), Vancouver (2010), and Sochi (2014) are exactly the same size, both in terms of K-point and Hill Size. The other thing of interest is that until 2006, both the normal hill and large hill tended to get bigger at each Olympics. Finally, note that the normal hill used at the 2002-10 Winter Olympics, at a hill size of 106.0 m, is approaching the maximum for a normal hill (109.0 m), as defined by FIS regulations. The large hills, however, remain well below ski flying specifications and could theoretically be made larger at future Olympics.